1 down, 1000 more to go? 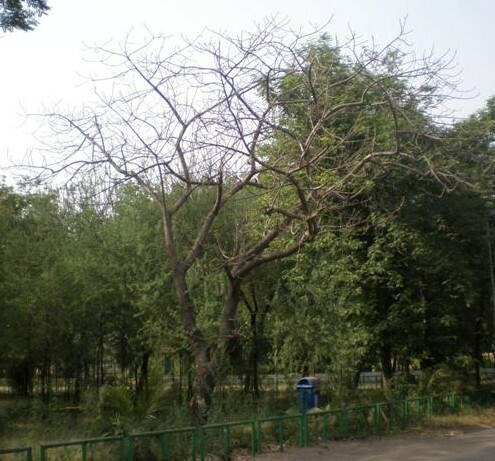 One of the trees in the (Delhi) University campus was so brutally marked that it has failed to bear leaves or flowers this season, even when the fall season has long been over. It may never do. It has now become a passive ecosystem provider just like the tree mentioned in the previous post. Even though all the other trees in its vicinity are contributing to the greens, this tree has been incapacitated to do the same (This is how). The tree was in its full glory this time last year. The Bottomline is: No Project of any kind has even been started, still one tree (out of about 1000 marked) has already been left to die a slow death and only provide us with its passive services. Unscientific and callous marking has taken its toll. We hope no other tree is ever given such a deadly return gift.